You’re ready to enrol your puppy into obedience classes. But with so many options, including clicker or food-based reward training; as well as a group or private classes, it’s hard to know what is best for you and your canine companion. The first thing you have to decide on is the method of teaching you want to use to train your dog. Reward training is just that – you reward only desired behaviours and ignore the bad. But as puppies don’t know the difference between good and bad behaviours, we have to teach them. The most common method of reward training is using hand signals and verbal cues. For example: you want to teach your puppy to sit. Place the treat in front of the puppy’s nose. This will get him to pay attention. Then give the ‘sit’ command. When the puppy starts to lick/nibble at the treat, lift it over his head and hold it there. As the puppy lifts his head to nibble the food, his bum will hit the ground and be sitting. Give the treat, along with lots of praise. Clicker training involves using a clicking sound to let the dog know he did the command correctly. In order to get your dog to make this association, you have to load the clicker – repeatedly click then immediately offer your puppy a treat. This gets the dog to associate the click with a treat. Once this association is made, training can begin. One note of caution with the clicker: the handler must click at the exact moment the dog does the desired behaviour (sit or down, for example). If the dog lies down, then rolls over, and the handler was slow to click the down, and actually clicked after the rollover, the dog just learned that rolling over was the desired behaviour, not the down. Luring can also be used to speed the process along. Just as with reward training, the treat is held above the dog’s nose. As soon as the dog’s bottom hits the ground, the clicker is triggered, and the treat is given. Once you have chosen your method of training, you then have to decide if you want to attend group classes or if you want to train your dog in private. Group training usually consists of a bunch of dogs, all roughly the same age, all learning the same basic commands at the same time. 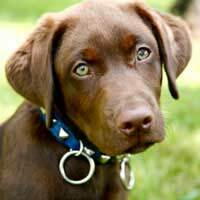 Make sure the class you choose is appropriate for your puppy’s skill level, as well as his age. “Group classes are for an owner who has the time to train and for the dog who has no real problems other than he is out of control,” explain Brian Kilcommons and Sarah Wilson in Good Owners, Great Dogs. A good group class will have no more than 10 dogs in it; an instructor familiar with all breeds of dogs; teach more than just the basic commands – knowledge of behavioural issues is extremely important; and the class must be structured in such a way that it is fun for you and your puppy. If there are children in your home, having them attend the classes is also important. If there are no classes in your area, or none that you find suitable, private training is another option. “It is individualised to suit your needs,” according to Kilcommons and Wilson. Private training is also good for dogs that have behavioural issues – aggression towards strangers or other dogs, for example. Whether you are looking for private training or group classes, ensure the trainer teaches you how to teach your dog. Another sign of a good trainer is that he/she has the ability to acknowledge that some situations are beyond his/her knowledge, and tells you as such. Inappropriately training techniques can lead to bigger problems. To find a good trainer, ask around - your veterinarian, groomer, local pet shop manager, as well as friends who have used trainers, for their recommendations. There is a third training option – boarding - although it is not recommended by many well-recognised trainers. “Sending your dog away is a shortcut, but it is not a miracle,” according to Kilcommons. The pros to sending your dog away for training include: your puppy is not around and you are not involved in the training; there are immediate results upon your dog’s return; and if you follow through correctly, your puppy will respond to the training. On the downside, your puppy is away from you; you’re not involved in the training; it’s expensive; and quite often owners will fail to keep up the training. “Problems can resurface or may get worse because of the structure provided in the training environment,” according to Hodgson. If this is the route you choose, do a thorough investigation on the techniques the trainer uses, as well as the facilities.